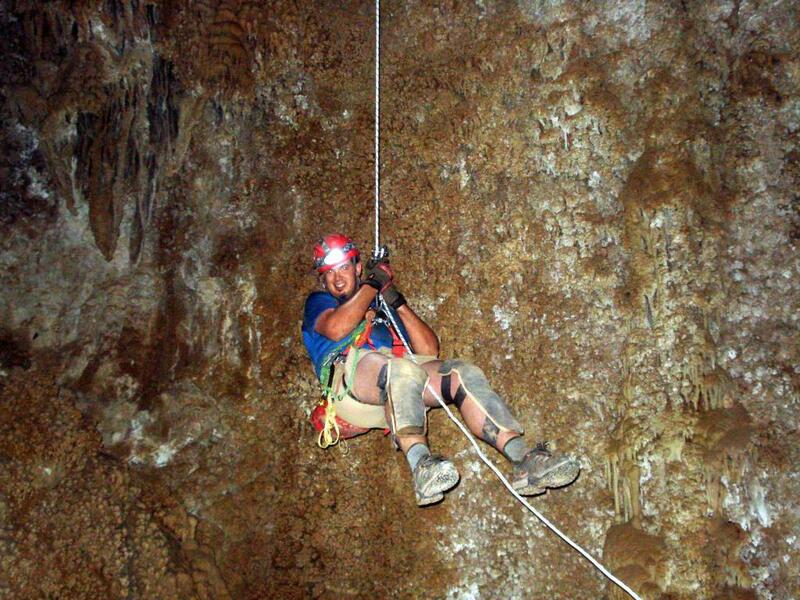 Recently I took a trip that included 300 feet of rappels to the bottom of Cave of The Winding Stair. My Search and Rescue Team specializes in Cave Rescue. Every few months we do our best to train in-cave. Last month we headed out to the Providence Mountains in the Mojave National Preserve. After camping overnight, we met up with some folks for the Barstow Mine Rescue Team for our joint in-cave-familiarization training (video of our previous joint training, in-mine). We then made our way on a relatively rough 4WD trail to the cave parking lot. Being that we were doing a rescue scenario, we had to hump a good deal of gear. The trail is less than a mile long, but up the whole way. I prefer walking up-trail before caving. Walking up-trail caving is no fun. Once inside the cave we split into two groups. The first group, which I was part of, was comprised of people who had never been in Cave of the Winding Stair. Our goal was to rappel down to the bottom and ascend back up while the second team prepared the rigging for the rescue scenario. John Norman led our group, having been in the cave many times. He rigged each of the 3 drops and we rappelled down after him. The final drop was a 130 foot free hanging rappel. Fun! We made it to the bottom of the last rappel in roughly two hours. Once there we climbed down to the lowest point of the cave and signed the register. After climbing back up to the main room we rested, snacked and then begun our ascent. Rappelling is easy, you just go down the rope. Ascending is hard work. I use the Frog System which works well for tight squeezes and passing knots and rebelays. It's a real workout going straight up a rope, and even more challenging to go over an edge or through a squeeze. Either way, though, it was good fun. As you can see in the photo below, I was wearing shorts. I probably should have worn pants as the rope ended up giving me an abrasion on my leg that made the final ascents painful. Once we were back at the top of the cave in a section called "The Office", the second group had finished rigging the rescue scenario. To make things a bit more... interesting, we had two photographers from the Sheriff's department with us. We rigged a separate system for them which included an interesting winch-like device called a paillardet. The paillardet is great for raising and lowering a single-person load, but it weighs a ton. We ran the rescue scenario successfully, pulling our mock patient, a litter attendant and both photographers out of the cave. Unfortunately I didn't get a free ride out! Caving is great fun and I highly recommend it as long as your aren't afraid of tight spaces, the dark, spiders, bats, heights, exposure or getting dirty. This photo taken by my teammate Jen Hopper shows me hanging at the bottom of a 130 foot rappel in Cave of the Winding Stair.